Welcome, welcome! Ladies and gents, I bid you welcome to the infamous Iceberg Lounge! This establishment is the hottest club in Gotham, but this time it's a special treat. Penguin is calling together several cohorts in crime for a one-night gathering. The night will definitely be one you won't want to miss! As this is a Formal Ball, formal dress code with masquerade-style masks will be enforced. Please note that this is a separately ticketed event and is therefore not included in a standard ticket entry (ie.. Standard Weekend Pass, Standard Single Day Pass). Entry with a VIP pass is free. Dress Code: Formal attire. Formal cosplay. Free with VIP Weekend Pass. Is this a separately ticketed event? Where do I get tickets at? Click here to get your Crystal Carnevale tickets. 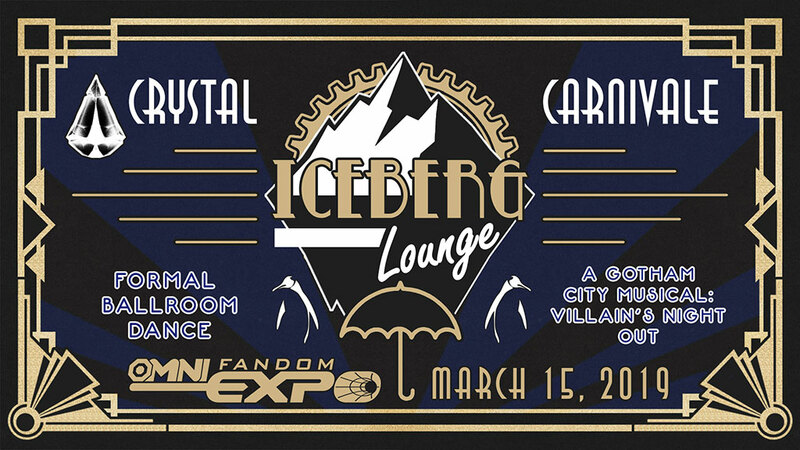 Do I have to have a OMNI FANDOM EXPO convention pass as well as a ticket to the Crystal Carnevale? No. You do not have to purchase additional OMNI FANDOM EXPO tickets or passes. Does having a VIP pass get me into the Crystal Carnevale for free? The music will be traditional, formal event music. Yes, there will be ballroom style dancing! When should I get in line at the convention? The event starts at 7:00pm; so, we recommend you are in formal wear / costume and in line outside of the Main Events room by 6:30pm. Do I pick up my tickets at registration? Yes, bring your emailed printout ticket(s) confirmation from OMNI FANDOM EXPO to the Pre-Registration line in order to receive your corresponding event ticket(s). Don’t forget to have a form of Picture Identification with you (Driver’s License, State ID, etc..) in order to pick up your ticket(s). Who do I show my ticket to so I can get in? The event door guards will be checking your ticket in order to give you entry to the Ball. Can I get kicked out of the event if I don't behave? May I wear a costume? As long as it is Gotham City themed or is in anime / video game / scifi formal-wear design, then yes. This is a masked formal ball. Casual dress is not allowed. This means, no jeans, sneakers, etc. You will not be permitted into the event unless you are in formal dress with a masquerade-style mask. Can I wear a formal version of a character from another show? Yes. This is a Masquerade event. What if I have a question about my costume? Can I write in and ask about it? Yes. Please feel free to write us at info@omniexpo.com.